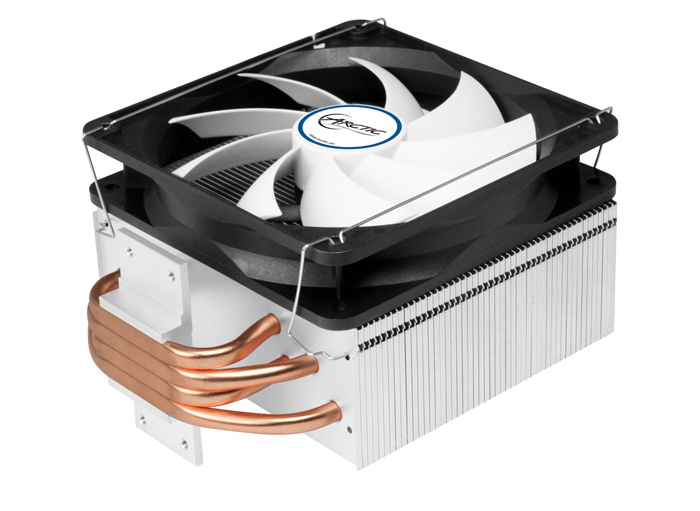 ARCTIC has launched a new semi-passive cooler for both Intel and AMD CPUs. The Freezer i32/A32 uses a "sophisticated fan controller enables that the CPU is completely passively cooled during typical Windows operation." Active cooling, via the installed 120mm fan, is not expected to kick in while the user undertakes tasks such as office productivity, web browsing or watching videos. The new coolers are said to offer a maximum cooling capacity of 320 watts and are recommended for use with processors up to 150 watts TDP. ARCTIC has designed the Freezer i32/A32 to be compact and problem free in installations, as it will not obstruct your access to RAM sockets, even if you have two F12 120mm fans installed on the cooler (optional). As headlined, the key USPs of these new ARCTIC coolers are their semi-passive cooling behaviour. 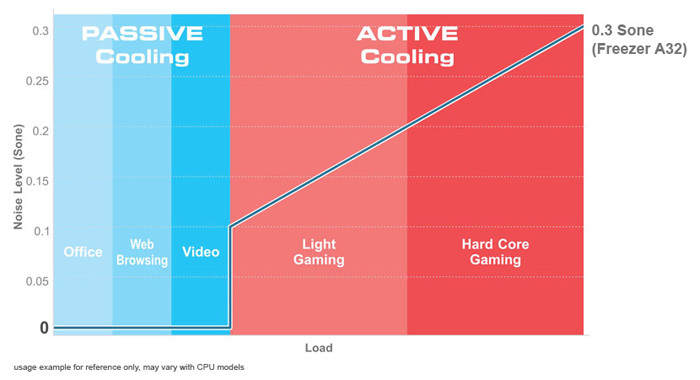 ARCTIC says that the fans do not spin up during typical Windows operations but activity on a par with light-gaming will likely spur the fan into action. This is thanks to a new fan controller that was developed in Germany. Comparing the new Freezer i32/A32 to its own i30/A30, ARCTIC claims that it has created the "New price-performance champion". Please refer to the diagram below for comparative cooling performance charts. The firm has managed to beat its own previous model with a lighter weight and more compact design. 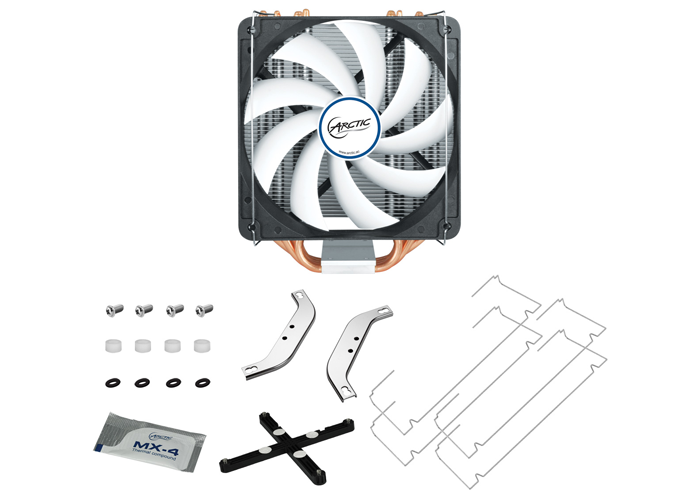 The F12 installed fan uses a new alloy/lubricant combination for lower noise and longer life. 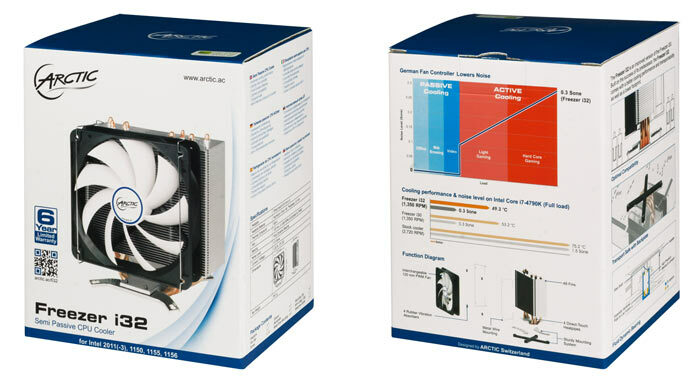 As well as the above Intel and AMD system targeted coolers ARCTIC has launched a Continuous Operation (CO) version, designed for Intel systems that are intended for 24/7 operation without hiccup. The Freezer i32 CO employs an enhanced Japanese dual ball bearing said to be 5X more durable and less sensitive to dust and high temperatures. ARCTIC says the Freezer i32/A32 is now available for a price of £49.99, with the CO version at £59.99, from ARCTIC and also at Amazon and Ebay. Why bother? Those fans are silent below 50% anyway. Does the CO version fan continuously spin even under light load?